By now it should be clear that the monetary experiment currently being carried out in Japan (known as “Abenomics”) is fundamentally different from the kind of quantitative easing which was implemented in the United States and the United Kingdom during the global financial crisis. In the US and the UK QE was implemented in order to stabilize the financial system, while in Japan, and now the Euro Area (EA) the objective is to end deflationary pressures and reflate economies which are arguably caught in some form of liquidity trap. In particular it is hard not to draw the conclusion that something structural and more long-term is taking place in Japan, and that that something is only tangentially related to the recent global financial crisis. One plausible explanation is that Japan’s long-lasting malaise is not simply a debt deflationary hangover from the bursting of a property bubble in 1992 but rather with the rapid population ageing the country has experienced. If this is the case then the ongoing economic stagnation in Europe may have a lot more to do with the Japan experience than it does with the recent economic dynamics seen in the UK and the US. The reason for this is simple: Europe’s population is the second oldest on the planet after Japan’s. 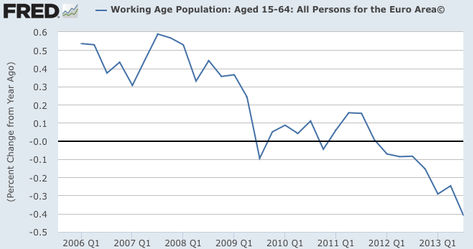 Certainly at first sight the similarity is striking, especially when it comes to working age population dynamics. So is the Euro Area the New “Japan”? “Europe is becoming Japanese” is an expression that is being used more and more. 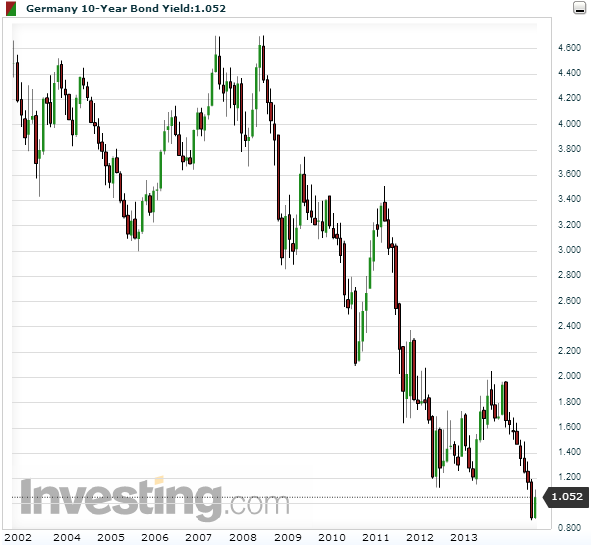 People saying this normally point to the fact that German 10 year bund yields recently went under 1% (and hence have started to look like 10 year Japan Government Bonds). But behind this argument lies some kind of “reverse causality”. In Japan JGB yields have been driven to very low levels by central bank intervention, with the BoJ now buying a very large share of all new issue bonds. In Europe, on the other hand, the ECB isn’t buying Euro Area sovereigns, the markets are in anticipation of QE. So to talk about the Japanisation of Euro Area yields is a little misleading. Bond purchasers and their models are provoking this downward lurch, not the central bank response to weak growth or creeping deflation. To really push Mario Draghi into Japan-style QE in the short term markets would need to move back into risk-off mode on periphery assets, yet there is little appetite to go for what might potentially become another “widowmaker” trade by taking on a powerful central bank. Yet as long as the bond markets remain relatively well behaved Draghi will try to do as little as possible. Inflation dynamics in Europe also look strikingly similar to those seen in Japan (but with a 20 year lag, see chart below). Strikingly Japan entered deflation not in 1992, but in 1997/8 at exactly the point the working age population peaked and in the EA it is happening in 2012/13 – just when EA working age population dynamics turned negative. The correlation may be just an odd coincidence, but it is striking. Naturally Mario Draghi will have none of this. “I think that the situation in the euro area is quite different from what it was in Japan in the 1990s and early 2000s”, he told an ECB press conference in December 2013. He then went on to offer five reasons. Reason No 1: “we have taken decisive monetary policy measures of great significance at a very early stage, even when, as a matter of fact, inflation was not at the levels at which it is today. It was way higher and way closer to 2% and this did not happen in Japan”. This is the case, but the vast majority of the ECB’s non conventional policy measures were intended to avoid financial instability, not to provoke inflation. The measures were largely liquidity oriented not outright “money printing” ones, so they were mainly addressing the monetary policy transmission mechanism – which was broken – not the fact that the refinancing rate was stuck up against the zero bound. There still hasn’t been sufficient analysis of why outright deflation didn’t hit the Euro Area sooner, but a big part of the story is probably associated with the presence of excessive rigidity in wages and prices and the constant consumption tax and administrative charge increases put in place as part of the deficit containment exercises. 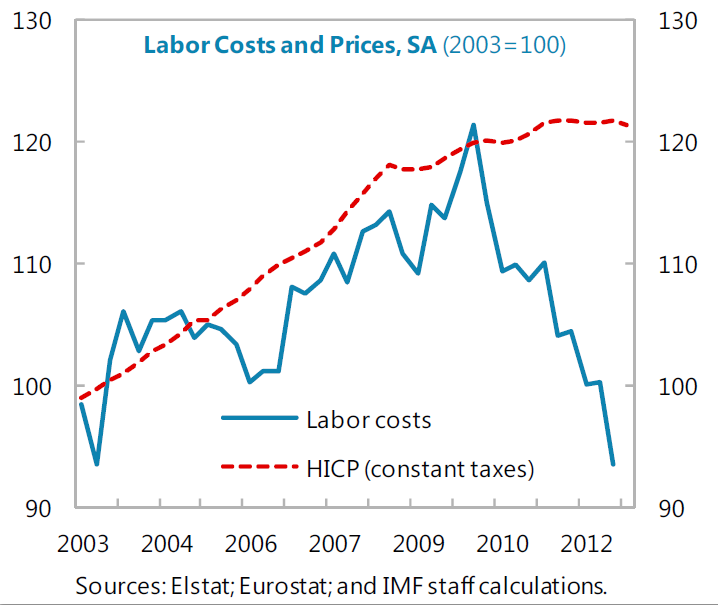 It is noteworthy that in Greece, for example, wage costs came down sharply a long time before the CPI began to fall. Well, maybe, just maybe, the ECB President has his timing a little bit out here. 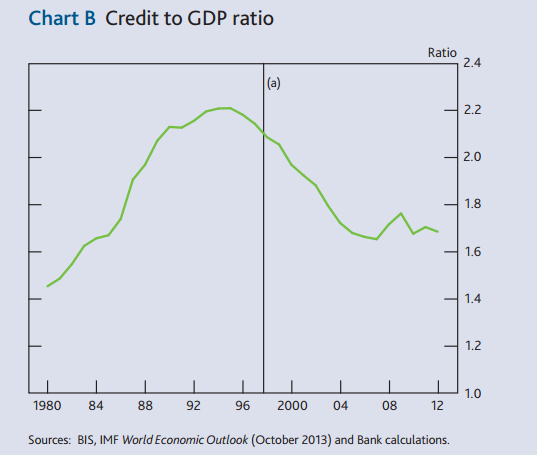 Japan’s bubble burst in 1992, and the banks started getting seriously recapitalized in 1998. The global financial crisis hit the Euro Area in 2008, and the AQR – which is supposed to be the prerequisite for realistic recapitalization – is taking place in 2014. The time difference in fact seems to match. So we could also say the necessary action on the part of the ECB also “lacked for many years”. Of course, banks in some of the most troubled countries have already been recapitalized once, most notably in Ireland and then in Spain in 2012. But still problems remain, which is why the AQR is taking place. Earlier stress tests have just not been realistic or rigorous enough. In a process not too dissimilar to the one taking place at the present time in the EA Japanese banks were recapitalized to the tune of 0.4% of GDP in March 2009, and by another 1.5% of GDP in March 1999. The order of magnitude of these recapitalization is not in any meaningful sense larger than that which is taking place in the Euro Area. Following an AQR type process conducted by the recently formed Japanese Financial Reconstruction Commission non performing loans were systematically identified and banks required to recapitalize accordingly. 14.8% of GDP’s worth of NPLs were finally identified, a figure not notably different from the current Euro Area one, and well below the levels prevailing in the worst affected countries like Spain and Italy. I just think Draghi is wrong about this. 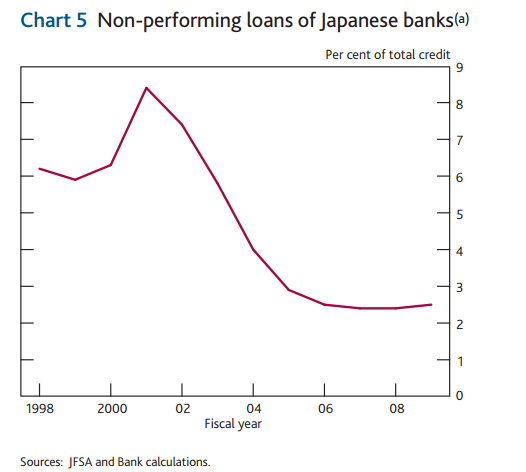 The level of credit exposure of Japanese banks to the private sector was not *that* different from the EA one in 2008 (see chart below) and as we have seen the level of distressed lending was pretty comparable. April 2013. The point being that Japan was still stuck in deflation up to that point (and may still be so when the effects of the devaluation and the tax hike wear off), and so it is a bit hard to pin all this on a couple of bad decisions in 1997 and 1998. Underlying structural factors are at work (liquidity trap, possibly driven by ultra low fertility) and these may be similar in both the European and the Japanese cases. It is true that the bank of Japan underestimated the scale of the problem between 1992 and 1997, but the same sort of accusation can be brought to the door of the ECB. In both Japan and the EA measures were (and are being) implemented to help banks avoid liquidity crunches in the hope that this will encourage lending, but in neither case has (or is) this had/having any evident success. The poor initial demand for TLTROs being just one example of this problem. Well, as Draghi himself admitted, the structural reform process in Europe is far from complete (France, Italy) and I think he also underestimates the kinds of reforms which were carried out in Japan at the time. The “lifelong employment” tradition, for example, was ended in the late 1990s. Bottom line, despite all the denials from Mario Draghi that the Eurozone is not another Japan there are plenty of grounds for thinking that it is steadily becoming one. 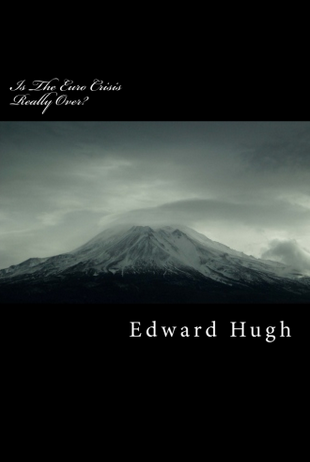 The above arguments are developed in detail and at far greater length in my new book “Is The Euro Crisis Really 0ver? – will doing whatever it takes be enough” – on sale in various formats – including Kindle – at Amazon. This entry was posted in A Fistful Of Euros, Economics, Economics and demography, Economics: Currencies by Edward Hugh. Bookmark the permalink.